Marijuana Guides offers a unique opportunity for dispensary owners to showcase their business and attract potential customers. We want to help you further your reach and stay connected within our vastly expanding industry. Reach out to potential customers by listing your dispensary and taking advantage of our platform to highlight it's strengths. Give your business the voice it deserves - it's free! Your dispensary profile will allow be visible to thousands of recreational and medicinal users - allowing them to find your location, and providing them with various methods of contacting your dispensary. Your dispensary profile will also provide an environment for both current and potential customers to engage with your community. Your dispensary manager can be used to add and managed products to be displayed on your dispensary profile. This area allows you to include product information such as brand, image, and pricing options. Customers will be able to review your products, find more information about the strain of marijuana, and ask questions about your products. Your dispensary menu can be managed in real-time, and will allow you to mark products out of stock, to keep your customers informed. You can use that product's comment section to let customers know when to expect it back in stock! Use your dispensary profile as a marketing channel by running promotions and discounts for your customers to see. This area will allow you to provide a date range for your promotion to run, and will allow you to specify any fine prints relating to the promotion (e.g. new customers only). When the promotion reaches the end date, it will automatically be hidden from your dispensary listing. 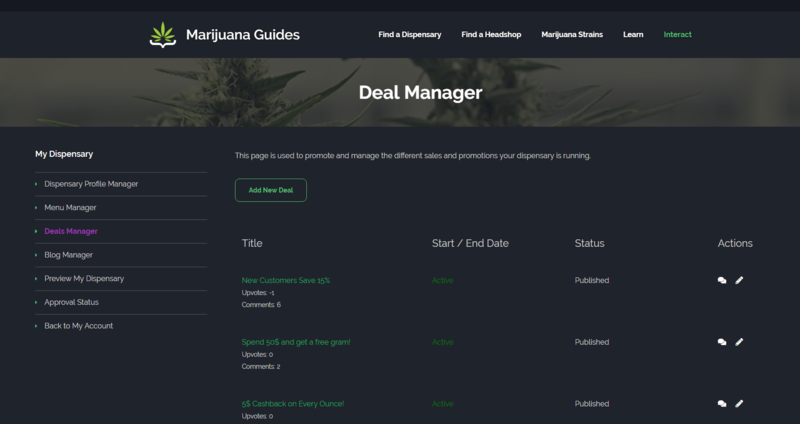 The dispensary manager will allow you to create your own dispensary blog, allowing you to share your knowledge with customers, and answer common questions. This is a great way to demonstrate staff knowledge and build credibility. It is also a great platform for building customer connections with your brand. In addition to your dispensary listing allowing you to share pictures of your dispensary store front and retail location, customers will also be able to rate their experiences and leave a review on your dispensary. These customer reviews can provide valuable insights into the mindset of your customers, and identify areas your dispensary is doing well - as well as areas that could be improved. Click any of the previews to view them larger. 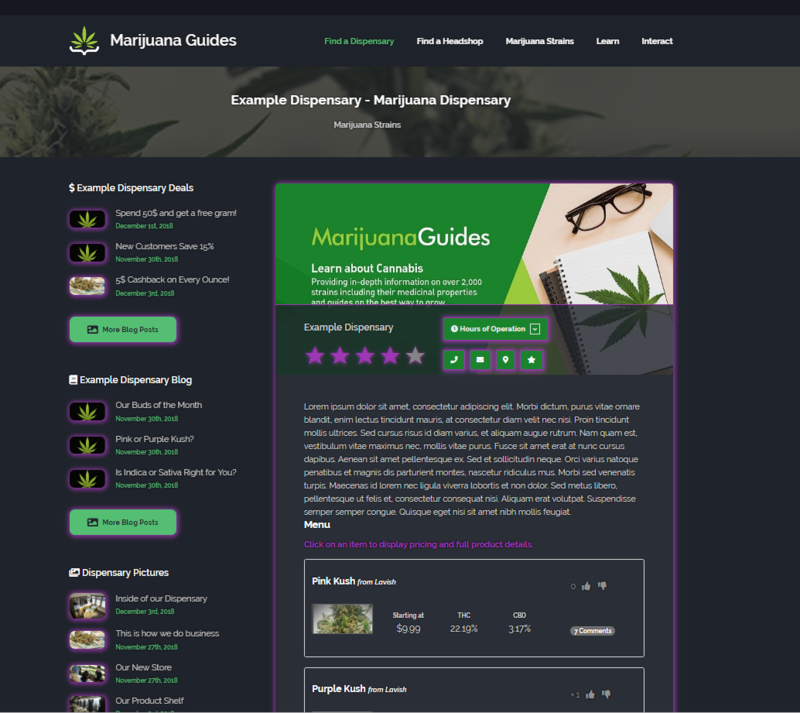 The dispensary area of the Marijuana Guides platform is currently an early version, with many features and additional functionalities on the way. Let us know if you have any suggestions!